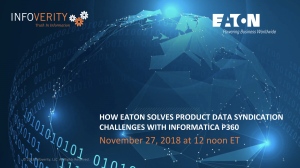 Join this webinar to hear Steven Chardon-Strunk, IT Program Manager, MDM/Business at Eaton Corporation, Steve Ruff, Global Director of the Product Solutions Group at Infoverity, and Mike Luthman, Managing Consultant at Infoverity, share best practices, lessons learned and next steps in Eaton’s Product Syndication journey. Eaton is a power management company with 2017 sales of $20.4 billion. Eaton provides energy-efficient solutions that helps customers to effectively manage electrical, hydraulic and mechanical power more efficiently, safely and sustainably. Eaton is dedicated to improving the quality of life and the environment through the use of power management technologies and services. Eaton has approximately 96,000 employees and sells products to customers in more than 175 countries.For more information, visit http://www.eaton.com. Founded in 2011, Infoverity is a leading global professional services organization focused on solving business problems caused by the proliferation and diversification of data in large enterprises. Infoverity provides Master Data Management (MDM), Product Information Management (PIM) strategy and implementation, data governance and analytics, managed services and hosting solutions that help clients in the retail, consumer goods, manufacturing, financial and healthcare sectors to simplify and maximize the value of their information. Infoverity is on the Inc. 5000 list and is #11 on the Columbus Fast 50. Infoverity is also recognized among the Best Places to Work in IT by IDG’s Computerworld, as a Best Place to Work by Columbus Business First, and as a Wonderful Workplace for Young Professionals. Infoverity’s global headquarters is in Dublin, Ohio, and additional service and support teams are located in Spain, United Kingdom, Germany and Russia. For more information on Infoverity solutions, visit Infoverity.com, follow @Infoverity on Twitter, and contact us today.